My roar goes forth throughout the land, penetrating the hidden places. Come out from among them and be separate, says the King of Kings, the Lion of Judah. My praise goes before you. When you worship me, there will be no fear of your enemies. Worship, of me, brings the Host of Heaven, to destroy your enemies. Your eyes fill to overflowing worship and praise of me, your Lion King Eternal. You will not tremble, at the threats from the enemy, but fall in reverential fear, before your King of Kings. 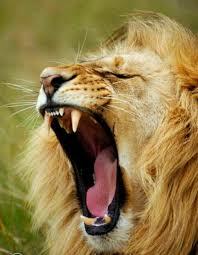 One roar from my mouth, sends the enemy into confusion and defeat. Rejoice and be glad, as you hear my roar go forth. Fear not! Trust me with your whole heart. Rejoice in me! The fire in my roar has routed your enemies.